AIO (all-in-one) computers fit all the hardware into the back of the monitor display in a single unit. This means no wires, no hassle. And now with Windows 8, you can even use AIO without any keyboard and mouse! It’s huge, heavy with well-built finishing like a TV set. The metal stand holds the display firmly, but the screen offers limited tilt angle from 5 degrees forward to 20 degrees backward. I would hope that the stand could swivel but I believe that would compromise the sturdiness of the product. 27-inch is a fantastic size when using the PC from 2 feet away. The screen is bright and sharp with good contrast details and accurate colour reproduction. But where touch input is required, 27-inch feels too large. All your Windows gestures have to be bigger: imagine gliding your fingers from the top to the bottom of the screen to close apps, or to stretch your hands to the left and right of the display to access the menu options. And it’s not exactly easy to glide the fingers on the ET2701 glass surface: it feels squeaky and rough to the touch. The AC adapter is also unusually large, carrying 19.5V, 7.7A of power to the ET2701. The ET2701 is generous in the connectors. Besides the usual LAN, USB and memory card slots, it has an HDMI-in and VGA-in port to support external monitor function, as well as a TV-jack for watching cable channels. The ET2701 also supports Device Share: what it means is when you connect external laptop or desktop to the ET2701, the USB ports, webcam, touchscreen of the ET2701 can be used with the external computer. The Bluray drive is the typical laptop pop-up tray type. It would be great if it were the slot-in type. The monitor control buttons are hidden behind the display glass, near the power button. I can’t see them so I had to feel them. The fact that they are touch-sensitive controls makes adjustments rather frustrating, since a light touch would activate the controls. The ET2701 comes with an external subwoofer (no additional power required) to complement the built-in stereo speakers. The audio level is loud enough to fill up the room without sounding noisy thanks to soft treble, while the subwoofer delivers just the right amount without overpowering the main speakers. It’s certainly worthy of general listening, definitely better than most built-in speakers I’ve tried. I would recommend enabling the DTS UltraPC II audio settings to improve the audio output. The review unit is armed with a very fast processor – Intel i7 3.1GHz 8GB RAM – and discrete graphics card. I am spoiled by the speed the ET2701 is delivering. I tried running Abobe Lightroom and pushing the computer with loads of effects and adjustments, and the computer responded swiftly. Other than the occasional CPU fan sound when running in overdrive turbo, the ET2701 runs in silence. Apart from the occasional hiccups where the web buttons do not respond to touch, the touch response on the ET2701 is good, and I thought the touch implementations have worked really well on the new Windows 8, even on legacy software. As I tried on MS Office 2007, the OS recognises my gestures for zooming, scrolling, highlighting with ease. As for Lightroom, the mouse works better, but touch input still beats using the trackpad. 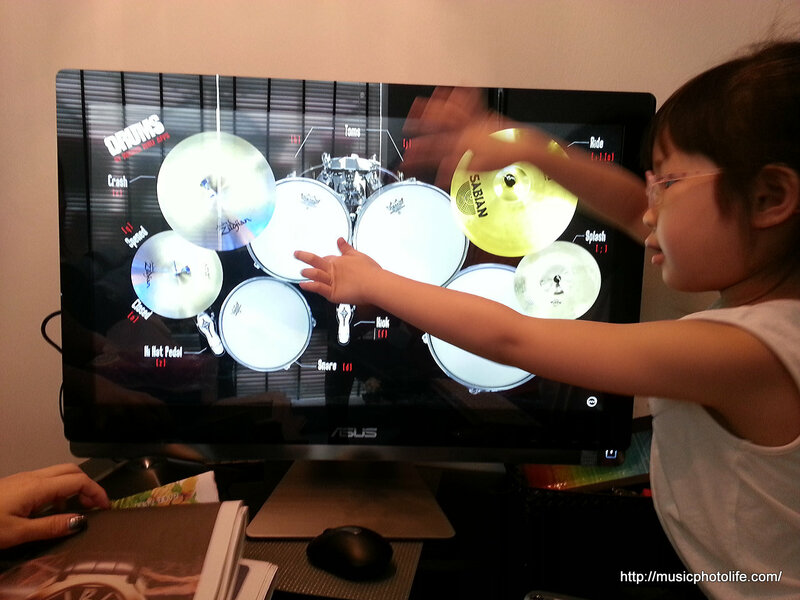 I guess the large screen estate helps in achieving better accuracy in touch-selecting. The only times I find myself using the mouse instead of touch is when I am too lazy to raise my hand to reach for the screen. I have many thoughts about the Windows 8, but I’ll leave it for another post. In short: I like the new experience and how the touch inputs work a lot better than any earlier Windows versions. The Asus ET2701 helps to deliver the experience to a high level. I did not test the on-screen keyboard because it is ergonomically not possible. And if I may suggest, Asus (or any AIO makers) should have implemented volume and/or brightness controls on the screen bezels to allow user to adjust these settings by gliding fingers on the unused bezel areas. This would further improve the touch interaction without the need of keyboards. And how about ambient sensor to auto-adjust brightness? Just borrowing ideas from the current tablet implementations. I find myself often struggling to adjust volume quickly on the ET2701. I was never a fan of AIO. After buying 2 branded desktops since early 1990s, I ventured into DIY desktops to achieve optimal quality over price. But I acknowledge that consumers today want aesthetics, and frankly, the desktop days for casual home users are over. Most people are buying laptops for their portability and low-price, but the problem with laptops is the small display screen. The Asus ET2701 is the first AIO I have ever tried and I begin to appreciate its convenience. The computer works out of the box without fuss. The wireless keyboard and mouse responds without lag, as if wired. It feels tiring to play touch-intense games like Fruit Ninja on the screen so huge, but it can offer high family entertainment value, bringing people together in one luxuriously-sized bright display. Chester Tan writes for XinMSN.